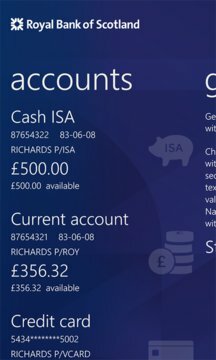 The RBS Mobile Banking app is available to RBS customers with Digital Banking who are over 11 and have a UK mobile number starting with 07. Once you’ve downloaded the app registering is simple, all you need to hand is your Digital Banking customer number, PIN and password to get access straight away. Get Cash lets you take out up to £130 per day from our UK cash machines, when you have at least £10 available in your account. There is a maximum limit of two Get Cash withdrawals every 24 hours. 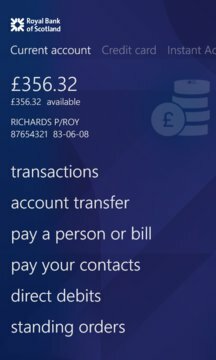 Pay Your Contacts allows you to pay anyone else who has the RBS or NatWest Mobile Banking app up to £250 using just their UK mobile number. We’ll send them a text to tell them you’ve sent them money and it goes into their account straight away. Standard data charges may apply - contact your network operator for details. For more information visit RBS.co.uk/Mobile or contact our Mobile App support staff on 0345 366 0013 8am to 6pm Monday to Saturday.